The South Africa Fish Sanctuaries Map is referenced in the latest NEMBA Invasive Alien Species Draft Regulations which were published in the South African Government Gazette on 12 February 2014. Incorporating the work of numerous researchers and with input from stakeholder communities, the map details the demarcations of fish sanctuaries and is embedded into the National Freshwater Ecosystem Priority Areas (NFEPA) map. Click here to open the correct interactive BGIS map. A NFEPA (National Freshwater Ecosystem Priority Areas) map will appear. To find your particular farm, type in your SG21 code in the “Search” text box found at the top, right-hand corner and press enter. An SG21 code is the unique 21 digit number given to each property by the Surveyor General. The results of your search will appear in the information panel, to the left of the map. Click on the “farm boundary: SG21 code” and the map should then zoom to your area of interest. Close your farm boundary details and search results by clicking on the cross on the top right hand corner of the results panel. You should now be able to view the list of available layers. 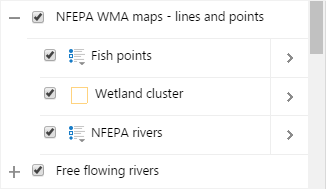 Scroll down the map layers list until you see “NFEPA WMA maps – lines and points”. Click on the plus sign next to “NFEPA WMA maps – lines and points”. The layer list should expand. 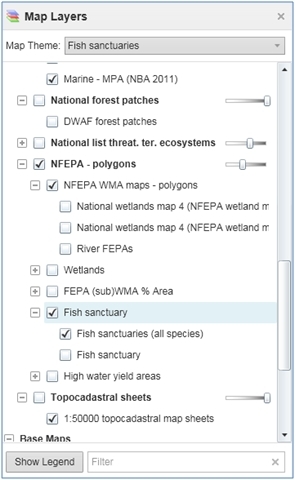 Tick the checkboxes next to “NFEPA WMA maps – lines and points” and “Fish points” if they are not already checked. Please note that the Fish Points layer will not appear on your map unless the both layers are ticked on. 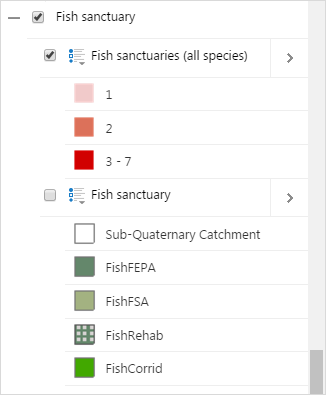 Scroll down the map layers list until you see “Fish sanctuary”. Click on the plus sign next to “fish sanctuary”. The layer list should expand. Untick the checkbox next to the second “fish sanctuary”. 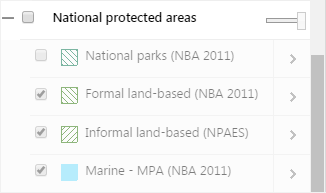 Scroll down the map layers list until you see “National protected areas”. Untick the checkbox next to “National protected areas”. 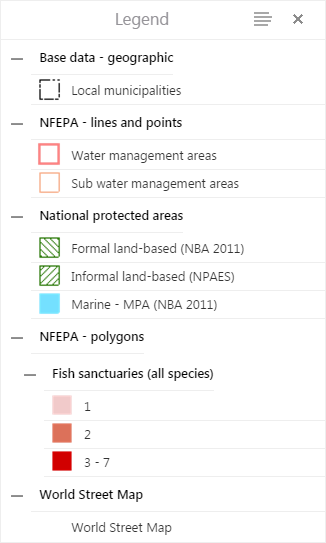 All protected areas falling beneath the group folder, “National protected areas” (national parks, formal land-based, informal land-based and marine – MPA), will no longer be displayed on your map. Click on the “Panel Actions Menu” button at the top of the information panel. The legend will appear. This will give you an idea as to what you’re currently seeing on the map. Fish sanctuaries are rivers that are essential for protecting threatened and near?threatened freshwater fish that are indigenous to South Africa. The associated sub-quaternary catchment is marked with a red or black fish symbol on the map. A red fish indicates that there is at least one population of a Critically Endangered (CE) or Endangered (EN) fish species within that sub?quaternary catchment. A black fish indicates the presence of vulnerable or near-threatened fish populations. The total number of threatened and near threatened fish species within their sub-quaternary catchment.